White House: Sorry Not Sorry For Fake Job Numbers - Joe.My.God. 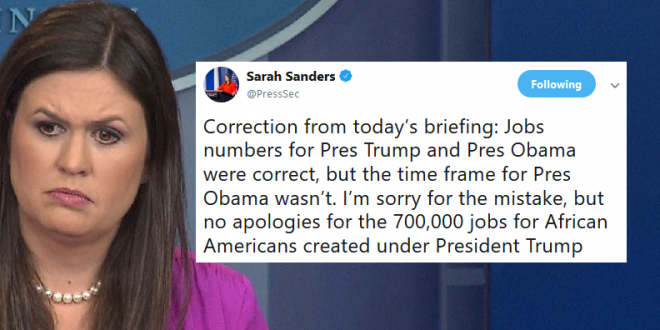 White House press secretary Sarah Huckabee Sanders apologized late Tuesday for wrongly stating that President Trump has created three times as many jobs for black workers as President Barack Obama did. At a news conference Tuesday, Sanders said Obama created 195,000 jobs for African Americans during his eight years in office. Sanders’s statement was false. According to official statistics, black employment in the United States increased by nearly 3 million jobs from January 2009 through January 2017. From January 2017 through July of this year, black employment has increased by about 700,000 jobs.